Welcome to the second installment of the new Wednesday/Friday smash hit, “Buy Sam a Drink”, where I break down two sides of a sports debate, declare a victor, and subsequently determine who owes Sammy a metaphorical drink under the “winner’s buy” clause of the Man Law. You can check out the much-discussed/linked-to first edition here. Without further ado, this edition’s match up…. WHO WOULD YOU RATHER START AN NHL FRANCHISE WITH: MARIO LEMIEUX OR WAYNE GRETZKY? If your bias-alert sensors aren’t going off, you should probably take them down to the shop and get ‘em checked out. I’ve been playing devil’s advocate to Gretzky supporters for years now, smoothly navigating around recitations of Gretzky’s stats and records as if they were cans of Iron City in a Heinz Field parking lot. Naturally, Gretzky’s numbers look better – his prime coincided with a booming offensive era in the NHL, he played longer than Lemieux, he was rarely injured, and he almost always was surrounded by superstars. Yet Gretzky’s advantage in a statistical analysis is not as drastic as many might contend. Gretzky averaged roughly 1.92 points/game during his career while Lemieux averaged 1.88 (if you take out Lemieux’s final season with the abysmal ’05-06 squad, then it is 1.90). Most Lemieux supporters will always point out that the difference in points in largely due to the fact that Gretzky always played with superstars, to which I usually respond: ever heard of Jagr? Stevens? Tocchet? Mullen? Coffey? Murphy? Francis? There is some truth to such logic, however. Consider that in Gretzky’s signature season, his 215 point ’85-86 campaign, his teammates Paul Coffey and Jari Kurri were third and fourth in scoring, obviously aided by Gretzky but clearly no slouches themselves. When Mario scored 199 points in ’88-89, he made ROB BROWN THE FIFTH HIGHEST SCORER IN THE LEAGUE WITH 115 POINTS. Rob Brown – the same man who would be playing in the IHL within six years. Furthermore, the stats are somewhat a moot point because of the way injuries didn’t merely hamper Mario’s career, but hampered him in his prime. From 1989-1994, or in other words from when Lemieux was 24 to when he was 29, Mario averaged 46.2 games a season. Mario didn’t even play in ’94-’95, a summer-time announcement that made me sit in my front yard looking like Ike Taylor after another fade-route TD. Playing half-seasons in your prime is no way to catch the game’s all-time leading scorer, yet Mario still managed to put up huge numbers. His 199 point season was done in 76 games while his 160 points ’92-93 season was done in a mere 60. Thus, if one is to award a statistical analysis in Gretzky’s favor, it must be done so with an asterisk. Whereas both superstars witness a decline in production in their later years, Lemieux’s statistical decline does not benefit from consistently gaudy numbers from his prime to pad his stats. The question at hand, however, is not one merely of statistics, but instead one concerning whom to choose as a centerpiece of a franchise. Sure, Gretzky’s stats are more outlandish, but, like Mario, did he have 13 short-handed goals in ’88-89, playing on the penalty kill in addition to fluffing up stats on the power play? No – he put up some stellar shorthanded statistics earlier in his career, but eventually settled for setting up shop in the corner. Ever seen a highlight of 99 breaking up a pass from Adam Oates on the penalty kill, taking it one on two against Oates and Ray Bourque, scooting the puck through Raymond’s legs and beating Andy Moog top shelf? These were the types of things Mario provided: mainly, an incredible ability to disrupt play on the defensive end and swiftly switch gears into a mesmerizing, full throttle offensive attack. Not saying Wayne couldn’t and didn’t do such things, but even in the wake of Sidney Crosby becoming a once-in-a-lifetime player, you constantly hear hockey fans discussing if he should be playing the penalty kill like Lemieux, if he should be playing, as Mario did, all facets of the game to help his team. Along the same lines of helping the team, it is possibly worth considering how often each player made the playoffs. Wayne has a clear edge here, though the fact that he made the playoffs every year with the Oilers is in large part due to how well constructed those Oilers teams were in the pre-free agency NHL. Strangely enough though, Wayne missed the playoffs with the Kings for three straight after making the Cup finals in ’92-93. Mario missed the playoffs five times in the ‘80s with simply atrocious Pens teams, and missed them four times in the ‘00s with similarly bad teams. The conclusion then seems to be simple: when Wayne and Mario were on great teams, they made the playoffs, and when they were on bad teams (or in Wayne’s case a Kings team that grew dysfunctional and old) they didn’t make the playoffs. To recap up to this point, Gretzky has an asterisked edge in stats, Mario a slight and biased edge in non-scoring related play, and Gretzky a slim though perhaps unimportant advantage in leading a team to the playoffs (hockey isn’t like basketball where one superstar can lead a crappy team to the playoffs; for proof, see: 2007 Cleveland Cavaliers, almost unquestionably the most-painful-to-watch starting five in NBA Finals history). For me, the clincher in such a close comparison is the image/cultural impact factor. If I own a hockey team, which guy do I more want to be the face of my franchise? Who will have a bigger cultural impact in the region? One of the most unrecognized achievements of Gretzky’s career is the fact that he infused hockey culture into California. Say what you want about the hockey knowledge of the West Coast, but the fact remains that when Gretzky was traded to the Kings, he not only reenergized the Kings fan-base, but one could argue that he spurred on enough interest to aid the movement of hockey teams to San Jose and Anaheim. Before the trade, the idea of three hockey teams in California would likely seem preposterous. Now the Sharks are seemingly yearly contenders and the Ducks are fresh off a Stanley cup victory. As for Lemieux…well, don’t we all know the story? Turned Pittsburgh into a legitimate hockey town, won two cups, vitalized youth hockey in Pittsburgh, saved the franchise by buying the team rather than simply cashing in off it, un-retired to help boost the squad to the conference finals, made a consistent, genuine, and ultimately successful effort to keep the team in Pittsburgh rather than cashing in and jumping town…. Speaking of jumping town, what about Gretzky? For being “The Great One”, he has a bit of Roger Clemens in him, doesn’t he? He bolted Canada, where he could have lived out his career and had a lifetime of free Molsons and Labatts, so that he could go to L.A. (supposedly to help bolster his wife’s acting career, but I will try very hard to consider that a rumor and not hold it against him). Then he played for the Blues, and then ended with the Rangers. And, oh yeah, now he coaches the Coyotes. 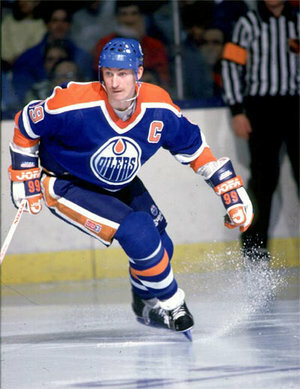 To me, it seems like Gretzky got a free pass from fan bases, much like Clemens does today. The greatest hockey player of all time played for FOUR organizations? Has that ever happened in any sport? Not that Wayne doesn’t still mean a lot to Edmonton, but good Lord, could you imagine if he had done for Edmonton what Lemieux did for Pittsburgh? Every time I hear the “franchise starter” debate on Sportscenter or a blog or wherever, it normally focuses on how Lebron is a better teammate that Kobe, or how LaDainian is a valuable asset to both the passing game and running game, making him more valuable. Well would so-and-so athlete live year round in the city of the team? Forfeit a huge paycheck to buy the team? Un-retire for the team? Forfeit a payday AGAIN out of loyalty and love for the region? Call me a homer and a purist, but I want my franchise guy to BE the franchise and to BE it forever. 99’s stats might be better and his records list might be longer, but so is the list of teams he played for. If I want to start a franchise, I want a versatile super-star committed to the cause. HEY MARIO! BUY SAM A DRINK AND GET WAYNE ONE TOO! Yup, that's the same point one of my esteemed co-editor's made to me, and its a damn good one. You'll realize the more you read my stuff that I over-value purist elements in athletes, hence why I have always been somewhat appalled by Gretzky floating around the league as if he was a checking line winger.